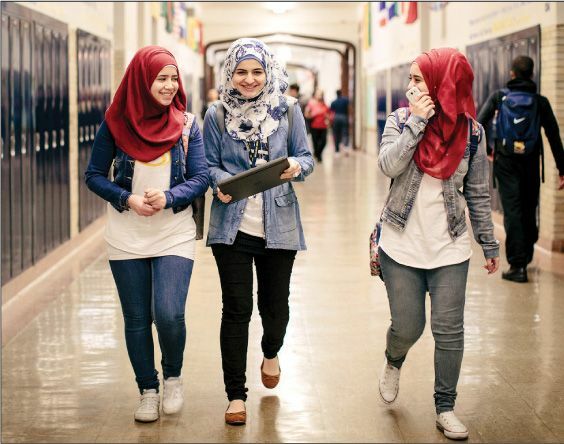 Dozens of refugees attend Chicago’s Sullivan High, where hijabs are as common as high-tops, said Elly Fishman. Teachers say the presence of so many foreign-born students has given the once failing school a new purpose. “Hi. How are you?” Quintenz asks. It only takes a few seconds to assess that Mohammad doesn’t. “He’s 1A,” Quintenz proclaims to the school counselor nearby. If Sullivan High School had a motto, it would be “Give me your tired, your poor, your huddled masses yearning to breathe free.” Its immigrant population now numbers close to 300—45 percent of the school’s 641 students— and many are refugees new to this country. This academic year alone, the school in Chicago’s Rogers Park neighborhood has welcomed a staggering 89 refugees—nearly three times as many as last year and far more than any other high school in the city. The recent surge, fueled in part by an influx of Syrians, has turned the school into a global melting pot, with 38 countries and more than 35 languages represented. The third most common language, after English and Spanish, spoken at Sullivan? Swahili. How Sullivan got to this point is a fascinating story of a school that not long ago was struggling for survival. When Chad Adams stepped in as principal in 2013, the school had been on academic probation for eight years running, its four-year graduation rate hovered at a woeful 54 percent, classrooms were barely half full, and violent incidents were common. “It was a place you wouldn’t want to send your kids,” says Adams, 40. Since Chicago Public Schools had already allocated funds based on projected enrollment, Adams now had some extra cash to play with. 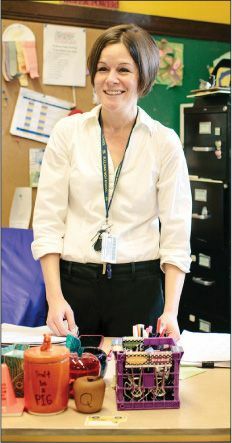 He decided to pour it into the school’s English Language Learner program (ELL), designed for refugees and other immigrants who speak little or no English. In essence, he was creating a new mission for the school. “Good afternoon. How are you?” Quintenz says to the class, her husky voice booming over the chatter. “Fine, thank you. How are you?” her students reply in unison. Quintenz’s class looks like a junior United Nations. The front row is occupied by a quartet of girls from Iraq, Syria, and Afghanistan, wearing hijabs. In the back sit a group of boys from Uganda, Rwanda, and the Democratic Republic of Congo. Among the five of them, they speak Swahili, Kinyarwanda, French, and Kirundi, and most conversations—soccer is a favorite topic—move seamlessly from one language to another. One afternoon, at my request, Quintenz has her students fill out questionnaires that ask for details of their journeys to America. (The assignment doubles as a lesson on grammar and punctuation.) A Rohingya boy explains that as members of a persecuted Muslim minority, he and his family fled Myanmar for Bangladesh, then Malaysia, after his grandfather and uncle were killed. Another student outlines eight countries—Angola, Malawi, Tanzania, and Zimbabwe among them—that her family has lived in since leaving Rwanda. One girl, who has been in the United States for only a few months, says that she misses the smell of jasmine in her native Syria but not the sound of bombs. Trauma is part of the cultural fabric in Room 106. The poster child is Thang Khan Khup, a 17-year-old from Myanmar. In the three years since Khup, as he prefers to be called, arrived in the United States, he has immersed himself in American culture. He’s on the school’s soccer and volleyball teams and plays guitar in a student rock band. His unofficial uniform is a denim jacket, a wellworn T-shirt, and frayed but fitted jeans (he cites Slash of Guns N’ Roses as a style icon), and his main means of transportation to school is a skateboard. Which is to say he’s like a lot of American kids. Except for a major difference: Seven years ago, he was living in a small village in Myanmar. After the military tried to recruit his dad and older brother as battlefield porters in the country’s civil war, Khup and his family fled south in the middle of the night. It took more than a week of “walk- ing through the jungle at night, like ninjas,” Khup says, their legs covered in leeches, to reach Malaysia, where the family spent four years before relocating to Chicago.